Less than two weeks left until take off! I woke up in a sweat on Wednesday morning, and not just because of the heat wave. I realized we had exactly two weeks left in Finland, and while we've pretty much gotten everything sorted, I started panicking that maybe there was something we'd completely forgotten?! In a way I feel too well prepared. There are a couple things to take care of still, I need to go to the bank to sort out my insurance and student loans. And then the packing of course... What the hell do I pack?! I need both summer and winter clothes, and shoes....? I've planned what snacks I'll bring on the plane better than what items I'll actually pack in my suitcase, ha. I leave you with this. 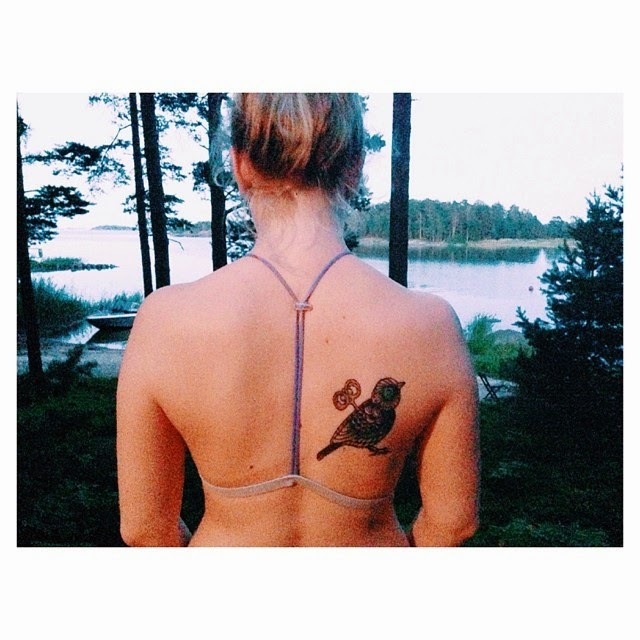 My own little wind-up bird in it's natural habitat (my back, ahhah). My only tip for you at this point: do NOT pack too much! You'll end up buying clothes and things you want to keep anyways, so pack as lightly as you can. I was told this before I left for my exchange, but I still packed too much. It was hell coming back: I had so much stuff and I ended up throwing away some things I had brought from Finland. 23, Finnish, living in Arkansas until the end of 2014.